Average daily trading volume of the world’s largest cryptocurrency Bitcoin has reached its fresh highs since April, 2018.Independent crypto data researcher Kevin Rooke brought the community’s attention to bitcoin volume via his Saturday tweet. The analyst revealed that traders, in March, changed hands for/to the cryptocurrency to the extent of approx $10 billion. In comparison, those numbers were as low as $6.25 billion in November 2018, the month in which bitcoin price plunged 35 percent owing to the Bitcoin Cash hard fork fiasco. Bitcoin Volume Since March 2018 | Source: Kevin RookeThrough the Crypto CrashIn retrospective, the early 2018 drop in the cryptocurrency market didn’t just wipe off valuations but traders as well. Following the crash, lesser investors were entering the crypto market, including bitcoin. That was visible in the lower trading volumes between June 2018 and October 2018. Between that period, bitcoin managed to secure a stable support level near $6,000, even though the price formed lower highs on each bounce back action. In November 2018, Bitcoin broke the $6,000-support and eventually established a new bottom near $3,100 in December 2018.The downside price action erred potential investors, indeed. Between November 2018 and January 2019, the average bitcoin trading volume was almost the same, showing poor traders’ presence in the market. However, in February, the numbers jumped to near $7 billion. And in March, they surpassed even the February’s impressive recovery.“Bitcoin’s daily exchange volume is booming,” noted Rooke. “Volume has increased [approximately] 150 percent in the last five months. Average daily volume hasn’t been this high since January 2018. 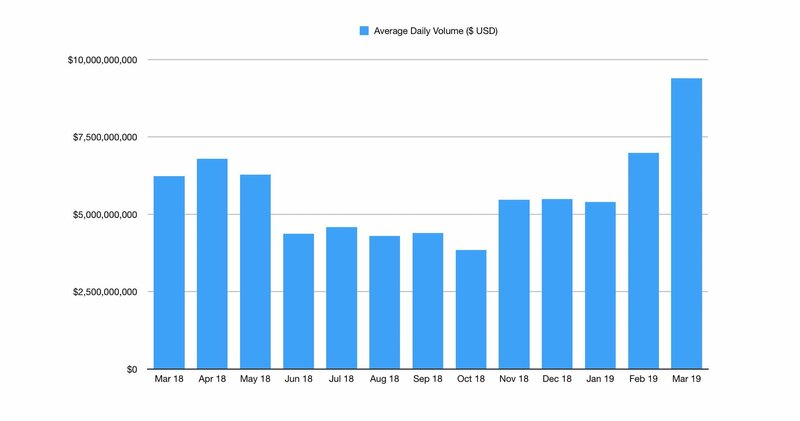 Only 9 days in the last [twelve] months had $10 billion-plus in volume – five of those days have been in March 2019.”Bitcoin’s daily exchange volume is booming Volume has increased by ~150% in the last 5 months Average daily volume hasn’t been this high since Jan 2018 Only 9 days in the last 12 months had $10B+ in volume 5 of those days have been in March 2019  pic.twitter.com/0VE9bX9iGQ— Kevin Rooke (@kerooke) March 16, 2019Reviving Investors’ PresenceVolumes do not specifically signify a market’s bullish or bearish bias. But they do behave as indicators to confirm investors’ presence. Bitcoin has been a thinly-traded market despite its long-term bullish potentials. The 2018 crash didn’t do it any good. Negative media reports, followed by the world’s leading economists’ dismissive views, didn’t help to revive the bitcoin trading sentiment for most of the year. As a result, the cryptocurrency’s volume remained lower than it used to be.However, since December 2018, bitcoin has attempted to fight its way back to the bullish zone. The digital asset’s rate against the US dollar recovered 18.23-percent since its so-called bottom formation at $3,100, according to data available at OnChainFx.com. Interestingly, the rise in bitcoin’s daily trading volume happened at the same time. That explained that more investors came inside the bitcoin market when it showed signs of recovery in January, which ultimately led to a volume surge in February and March.Nevertheless, bitcoin exchanges continue to receive criticism for allegedly inflating their trading volumes artificially. A report published by Blockchain Transparency Institute revealed that most of bitcoin’s reported volume of CoinMarketCap.com was 99 percent fake.“Over 80% of the CMC top 25 BTC pairs volume is wash traded,” the institute wrote. “These exchanges continue to use these strategies as a business model to steal money from aspiring token projects.”If this is true, then it could pose a massive challenge for bulls to prove bitcoin’s long term bullish perspectives.